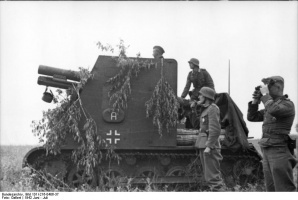 The Sturmpanzer I Bison is a German tier 3 self-propelled gun. Desarrollada desde 1939 hasta 1940 sobre la base del Panzerkampfwagen I. Equipado con el cañón s.I.G. 33 de 150 mm, que estaba montado junto con el transporte del cañón. La cadencia de tiro era de 3 disparos por minuto, a bordo cabían 8 proyectiles. El vehículo requería el apoyo de un transporte de munición. Se usó a esta AAP desde 1940 hasta 1943 durante la campaña francesa, la de los Balcanes y en el Frente Oriental. Más tarde se desarrolló el Sturmpanzer II con un tipo de cañón similar. 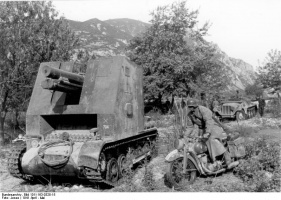 The Sturmpanzer I Bison leads to the Sturmpanzer II. 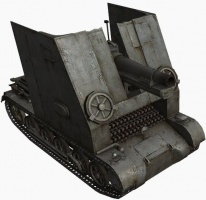 The Bison differentiates itself from the other tier 3 SPGs by firing bigger shells with a slower rate of fire. A direct hit is fatal to most of the opponents it faces. The slow rate of fire is painful, but what really hurts is the time it takes to aim on targets. The Bison can use two kinds of HE ammunition. The second one does much more damage, but also costs a lot more credits. They both take up the same amount of space however, so don't bother with the cheaper HE shells. 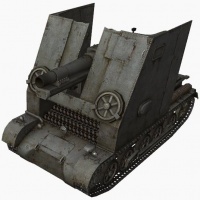 If you're looking for an SPG to learn the ropes of the class with, you're probably better off not going with this one, but if you're experienced with higher tier artillery already, then you're probably already used to slow reload times. Regardless, if you don't like the Bison, it doesn't take long to get through it. 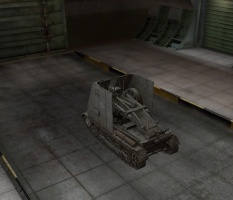 The Bison is a very slow SPG, having a low turning rate, acceleration, and top speed. It also doesn't hold too many of shells, so firing erratically is ill-advised. The Bison does, however, have an excellent firing angle at long ranges, allowing you to shoot if an enemy is completely behind cover. Also, the Bison can one-shot any tier 2-3 scouts with ease, and any tier 4 scouts with 75% health or lower. Missing in close quarters engagements will prove lethal, however, due to its very slow rate of fire. Be aware that using the HEAT shells on the Bison, the penetration goes up to a whopping 185. 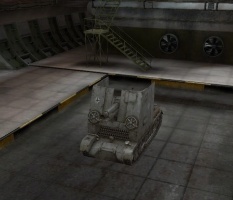 This means that the tank could penetrate and do full damage to any tank in the game, assuming the shot hits the right spot. However, take into account the very low accuracy on the gun when trying to do this. In all, consider the Bison the T92 of tier 3 artillery. 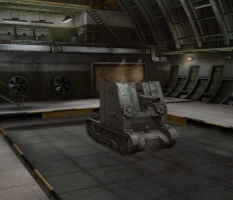 Although it has a very poor aim time, rate of fire and accuracy, it has a huge splash radius, damage and penetration that will be sure to severely damage or destroy most tanks it fires at. This makes this SPG paradoxically better the higher tier it gets; as the tanks get slower, this artillery gets more effective - crippling tier 5 tank destroyers, and can easily penetrate even a KV-1 if you hit the right spots. The Maybach HL 38 TR engine carries over from the Leichttraktor, so you can install it immediately. Your best bet is likely to research the upgraded suspension first. The 15 cm sIG 33 (Sf) auf Panzerkampfwagen I Ausf B was a German self-propelled heavy infantry gun used during World War II. The Invasion of Poland had shown that the towed sIG 33 guns assigned to the infantry gun companies of the motorized infantry regiments had difficulties keeping up with the tanks during combat. 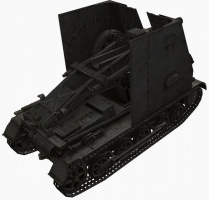 The easiest solution was to modify a spare tank chassis to carry it into battle. A sIG 33 was mounted on the chassis of the Panzer I Ausf. B, complete with carriage and wheels, in place of the turret and superstructure. Plates 13 millimeters (0.51 in) thick were used to form a tall, open-topped fighting compartment on the forward part of the hull. This protected little more than the gun and the gunner himself from small arms fire and shell fragments: the loaders were completely exposed. The rearmost section of armor was hinged to ease reloading. There was no room to stow any ammunition, so it had to be carried by a separate vehicle. When mounted, the sIG 33 had a total 25° of traverse and could elevate from -4° to +75°. It used a Rblf36 sight. 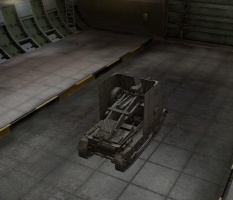 The chassis was overloaded and breakdowns were frequent. 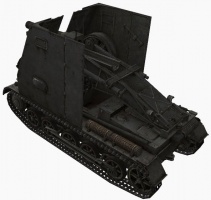 The vehicle's extreme height and lack of on-board ammunition were severe tactical drawbacks. Thirty-eight were produced in February 1940, by Alkett. Thirty-six of these were organized into independent schwere Infanteriegeschütz-Kompanie ("Self-propelled Heavy Infantry Gun Companies"); mot.S. Numbers 701-706 and these were assigned to the 1st, 2nd, 5th, 7th, 9th, and 10th Panzer Divisions in the Battle of France as well as Operation Barbarossa. The 705th and 706th were destroyed during Operation Barbarossa, belonging to the 7th and 10th Panzer Divisions respectively. Of the remaining companies, only the 701st participated in the opening stages of the subsequent Case Blue in 1942, although it, and its parent 9th Panzer Division, were transferred to the Army Group Center by the end of the summer of 1942. The last reference to them is with the 704th Company of the 5th Panzer Division during the middle of 1943. Bison on the Eastern front during the Operation Blau, summer 1942. Chamberlain, Peter, and Hilary L. Doyle. Thomas L. Jentz (Technical Editor). Encyclopedia of German Tanks of World War Two: A Complete Illustrated Directory of German Battle Tanks, Armoured Cars, Self-propelled Guns, and Semi-tracked Vehicles, 1933–1945. London: Arms and Armour Press, 1978 (revised edition 1993) ISBN 1-85409-214-6.